Meet Lisa Mazur, girl boss and business owner of Piper’s Cove, a small design and event company newly opened in Goffstown, NH. I’ve known Lisa for years, but it doesn’t take years of acquaintance to realize she has a penchant for aesthetics. 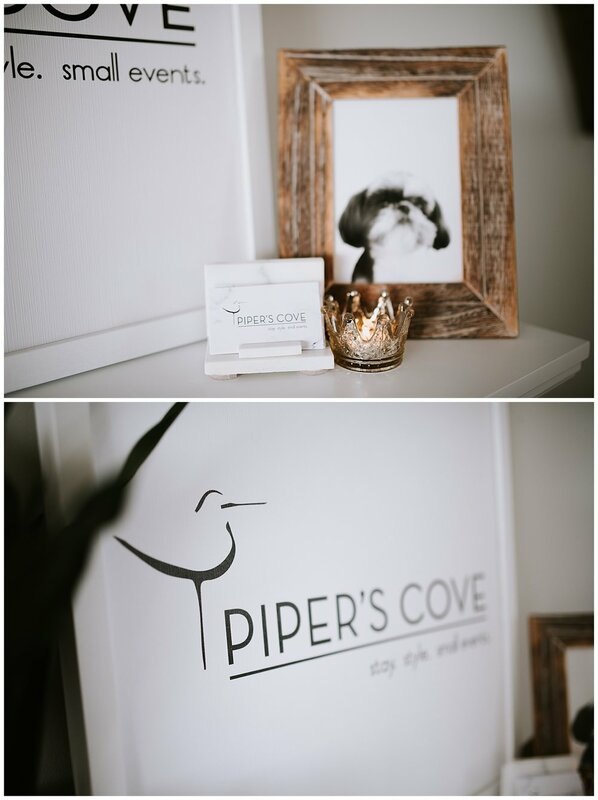 Last weekend she launched the grand opening for Piper’s Cove, and it was so fun to see her touch all over her new space. All the carefully curated items from her travels and sweet little piper accents are gracefully arranged and highlight the space beautifully. If you’re looking for design consulting, she’s your lady! Piper’s Cove is more than just the one location too, Lisa and her husband Brian own a lovely piece of property on Glen Lake in Goffstown that has an incredible view of the lake. Take a peek at the Piper’s Cove link and look at the event and lodging opportunities available! Take a moment to scroll down and see some images of her space and see what Lisa has to say about it in her own words! How did you dream up Piper's Cove and what led to it turning into a business venture? I absolutely adore living in New England and have always dreamed of living on or by the lake. That dream came true three years ago when we found an amazing property on Glen Lake, just one mile from the historic and quaint village of Goffstown, NH. I love hosting people and planning parties at our place, and also fell in love with interior decorating. Last year I became a certified design professional and have been planning and hosting events for years. I figured it’s never too late for new journeys, so Piper’s Cove – stay. style. small events. was born. Later this year or in 2020 we hope to open a lakefront cottage. Our dream is to have lots of guests “stay” here in the future and enjoy the peace and tranquility it provides. If you need a fresh or new look to your home or any room, book a “style” appointment and let me create an inspiration board for you. If you are looking to host a “small event”, or need help planning or decorating for one, let me help. Your small event can be held at the Piper’s Cove lakefront property or any venue. Tell me a little about a favorite project you've been working on/worked on for Piper's Cove? My favorite project to date has been designing and decorating my new studio space in the center of the village of Goffstown. It is located on the 2ndfloor of a historic building and has so much eclectic character. I absolutely adore it. It will be so much fun to host future consultation appointments and other creative workshops there. Where does the name Piper's Cove come from? Our furry kid, Piper, has been our cute and faithful sidekick for 15 years, and has always been up to every adventure with us. She kayaks on the lake with us and found her happy place here with her people. It was natural that we name our lakefront home Piper’s Cove. When did your love for design and aesthetics start? Honestly, when I moved to the lake. I was excited to design my new home in a modern farmhouse theme with a touch of nautical, but not over the top. Being on the water is very therapeutic and creatively inspiring to me. I found myself creating inspiration boards outside on my deck and drawing creativity from the water and the beautiful nature surrounding me. As I started to delve into it more and more, I found this artistic outlet that I couldn’t wait to share with others. What words of encouragement would you share with someone considering pursuing a dream and launching their own business? You are never too old or too young to try something new. If you are passionate about something and discover you’re good at it, go for it. Launching a business is not for the faint of heart, but it is so fulfilling to work hard towards something, and see it come to fruition. Check out Piper’s Cove at www.piperscovenh.com!